Altoholic is an Ace 3 add-on written for people who dedicate most of their time to leveling alts, and who want to have as much information as possible in one place. The add-on has been in development since December 2007 and was officially released in late March 2008. It provides you information about your alts (bags, mails, AH, etc...) without having to reconnect them all the time. This has been the long term effort and commitment of a single person. So if you like the product, consider supporting. I was born in '76 (you do the math) and I work as a Project Manager + Software Architect + Full Stack Web Dev (yup, multiple hats) in a large multinational, so my coding time is limited, and Work > Gaming. I live in Belgium, and obviously play on EU only. Assistance will be provided on a best effort basis, but in any case always be polite and respectful when asking for help, I am neither a teenager, nor a punching ball. I am a cool guy with people who are cool with me. Respect that rule and we'll be fine. 2018/09/29: I will be moving appartments at the beginning of November, so my gaming + coding time will decrease gradually until then. Do not expect movement until mid November. 2018/09/29: There is an issue with characters disappearing from the account summary. It can be solved by clearing your SV files (long & hard way), or simply by changing the level filter to "120", then back to "All" again. Thanks to the all the people who have supported the add-on since 2008, and also all those of you who came on board later. This i the pop up window i get. 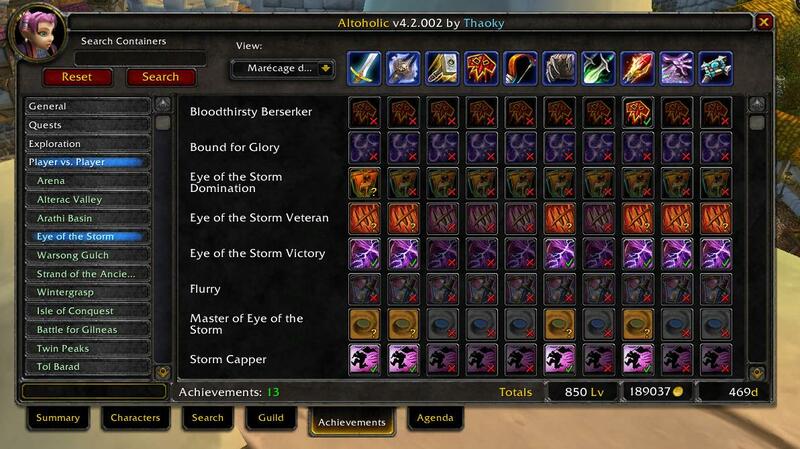 All Altoholic addons are greyed out. The interface cannot be called up, button not on minimap in game. This is with the "load out of date" checked, which allows Datastore addons to load. App isn't available in game, so.. hmm.. I did a reinstall, and yank out completely and re-install, same as above. Hey, I am having issues with cross realm tooltips. I have sent BOAs between the servers several times trying to trick it into connecting them, but to no avail. I have deleted the saved variables and reinstalled both altoholic and datastore. Keep in mind that once you've changed this, the Twitch Client will say that there is an update for Altoholic, as you have modified it. Don't update before you are 100% sure there is a fix or else you have to do these steps again!!! I had tro tell Twitch to ignore Altoholics, working for me now. Unable to see all characters' total account bound items in the item tooltip. (Polished Pet Charm) for example. I could find them all in the search feature, but I couldn't find a way of enabling polished pet charms x-realm on the tooltip. I wish I could see all 50 of my characters in level order without it being split into groups by realm. I used to use the WoW Armory app or website for this; but they discontinued the app, and the website now always splits by realm as well. Please consider adding this functionality. I'm getting the following error when trying to do account sharing. When account A made the sharing request to account B, account B gets the error. Please help. Click on all the required parts of the addon, including datastore boxes, then at the top right click the load out of date addons. Then I think you have to reload ui. Hopefully that helps. I'm seeing the same issue as you. In that fix I forgot about line 114. That line needs altering too. I've edited my original post so the info at the end of the link contains line 144 too. I had posted a better guide to fix this issue on the page of Altoholic. Anyways thanks for posting my fix. No issues with characters showing up, the issue I have in mail. I'll send something to a character and wait. When I check using the addon it doesn't show the character as having mail. Seems to only be on character that is having this issue so not sure if I'm the only player or if it is others also. Just figured I'd leave a message about it to make it known. Cannot check guilds or characters on other realms and this has been a problem since WOD, it will only allow me to view the characters and guilds for the realm/character I'm currently on. I also cannot delete realms I no longer have characters on too. Would be nice if anyone could help me out here or let me know if this is a known issue? Any news for an update with new slots on the grid ?